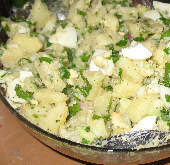 Mashing up your potato salad for babies may work for some, but for most, there are ingredients and perhaps spices that might bother young eaters, so this recipe is a great solution! 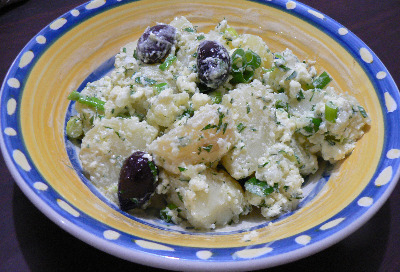 Potato salad is always a family favorite and this recipe combines the tastes of potatoes, eggs, and yogurt in a delicious dish for babies who are graduating from purées to more solid foods. * To rice the egg yolk, use a garlic press. Boil the potato until done. Depending on the baby’s age and eating habits, cut into small pieces or mash. Add riced egg yolk and yogurt, stir to mix well, and serve.